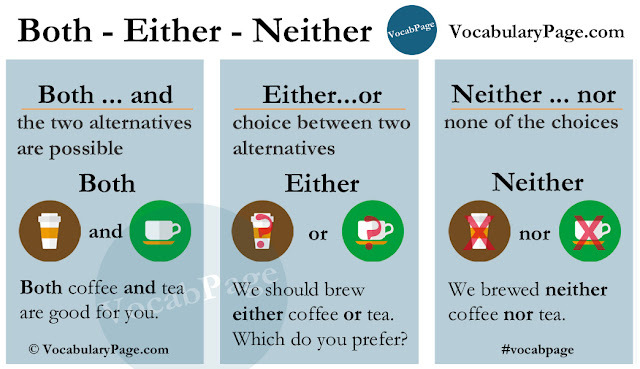 The pairs either...or and neither...nor are correlative conjunctions. They connect words, phrases or clauses that are grammatically similar. We use either...or to show a choice between two alternatives. For this recipe, I need either two or three cloves of garlic. He can be contacted either by phone or by email. It was either Alan or Ian who sent the package. You can either stay at home or come with me. I usually brew either tea or coffee. You can have either ice-cream or cake. Neither...nor is the negative form of either...or. It connects two or more alternatives that are not true. Neither my father nor my mother lived in London. Your method is neither simple nor effective. We brewed neither tea nor coffee. After neither, we use nor, not or. She could neither read nor write. She could neither read or write. Neither...nor is not used with another negative word. He doesn't speak neither Spanish nor French. He speaks neither Spanish nor French. Either and neither are used before the first alternative. The second alternative is introduced by or and nor. When neither...nor or either...or connects two single subjects, the verb should be single. However, if the second subject is plural, the verb should be plural. Neither my wife nor my daughter is vegetarian. Neither my wife nor my children are vegetarian. When each of two alternatives is true or possible, we use the conjunction both...and. Both he and his wife enjoyed the party. I've lived in both Russia and Ukraine. Both coffee and tea are good for you.